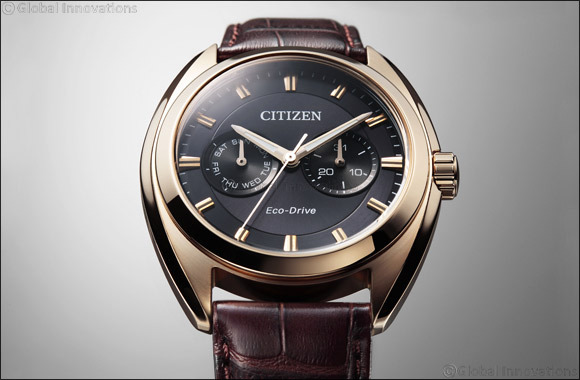 Dubai, UAE, October 26, 2017: Smooth and stylish, the BU4018-11H men's dress watch from CITIZEN is both classic and carries off an impactful personality. The watch's smooth lines accentuated by the rose gold plated stainless steel case, makes this a watch for the formal occasion. The dressy look is further underlined by the pleasing contrast offered by the black dial and the rose gold plated indexes as well as the brown calf leather strap. Powered by the 8725-01 Eco-Drive movement, this watch comes with a 6-month power reserve, water resistant up to 10 BAR and possesses an insufficient charge warning and overcharge prevention function.